Poisonous carbon monoxide gas has been discovered in the atmosphere of the dwarf planet Pluto, after a worldwide search that lasted nearly two decades, according to a new study that also detected the planet's atmosphere extendingmuch higher above the surface than previously thought. The atmosphere of Pluto was known to extend more than 60 miles (about 100 kilometers) above the surface, the researchers said, but the new findings raise that height to more than 1,860 miles (3,000 km) — equivalent to a quarter of the distance out to Pluto's largest moon, Charon. Greaves will present the new discovery on Wednesday (April 20) at the Royal Astronomical Society's National Astronomy Meeting in Wales. Pluto was discovered in 1930 and was considered to be the smallest and most distant planet orbiting around the sun. In 2006, its status was demoted to dwarf planet, making it one of a handful of such bodies that orbit beyond Neptune in the outer reaches of the solar system. Pluto is the only dwarf planet known to have an atmosphere. "It was thrilling to see the signal gradually emerge as we added in many nights of data," Greaves said. "The change in brightness over the last decade is startling. We think the atmosphere may have grown in size, or the carbon monoxide abundance may have been boosted." Fluctuations in the atmosphere have been seen before, but only in the lower atmosphere, where methane — the only other gas to be positively identified — has also been seen to vary, the researchers said. 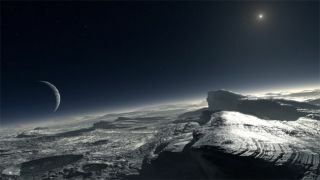 The atmospheric gases are likely the result of solar heating of Pluto's surface ice, which evaporates due to the slightly higher temperatures experienced during this period. In 1989 Pluto made its closest approach to the sun, which is considered a relatively recent event, considering that it takes the planet 248 years to complete one orbit around the sun. Pluto's resulting atmosphere is probably the most fragile in our solar system, the researchers said, with the top layers blowing off into the cosmos. "The height to which we see the carbon monoxide agrees well with models of how the solar wind strips Pluto's atmosphere," said Christiane Helling, a member of the research team at the University of St. Andrews. In Pluto's atmosphere, carbon monoxide acts as a coolant, while methane absorbs sunlight, which produces heating. Maintaining a balance between the two gases, which are actually just trace elements in what is thought to be an atmosphere dominated by nitrogen, is critical during the long seasons on Pluto that last several decades. The newly discovered carbon monoxide could play a key role in slowing the loss of Pluto's atmosphere. But, if the chilling effect is too great, it could result in nitrogen snowfalls and all the gases freezing on the ground, the researchers said. The processes on Pluto could also help scientists understand the mechanisms that govern the behavior of our own planet's atmosphere. "Seeing such an example of extraterrestrial climate change is fascinating," Greaves said. "This cold simple atmosphere that is strongly driven by the heat from the sun could give us important clues to how some of the basic physics works, and act as a contrasting test-bed to help us better understand the Earth's atmosphere."